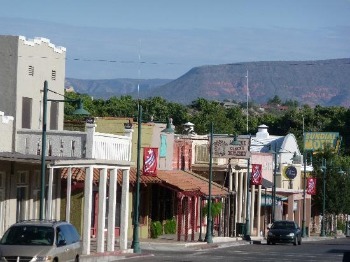 People that retire to Cottonwood, like the fact that Cottonwood is centrally located to lots of activities, yet with more reasonable real estate prices then nearby Sedona. Cottonwood is 20 miles from Sedona, 90 miles from Phoenix,and 50 miles from Prescott in the midst of the Verde Valley. Cottonwood is a small town, current population is just under 10,000, and celebrated being an incorporated city for 50 years in 2010. There are lots of things and activities to keep you busy if you retire there. We belong to Thousand Trails RV club and there is a nice park in Cottonwood...a great 3, 4 night getaway that also exercises the rig. Cottonwood has an old town district that provides many diversions. Looking for a place to stay, the Cottonwood Hotel, established in 1917 has five suites...and has a loyal following. You can see it on the left in the picture. Every second Saturday of the month starting at 3 PM there is an interactive walking tour of old town Cottonwood, starting at the hotel...check it out. Olive oil tasting, I'm not making this up, is also available in downtown Cottonwood. So for you Olive Oil aficionados that's another reason to retire here. Assuming that you've already been to Sedona...check out the old mining town of Jerome, perched on a hill, overlooking Cottonwood. A great place to spend an afternoon, 15 min. from downtown Cottonwood. Looking looking for a train ride, the Verde Canyon Railroad is a four hour adventure at 12 miles an hour...it doesn't operate every day of the year, so visit the website for the latest up-to-date information...it is a lot of fun. On a personal note, my buddies and I like to fly fish during the winter at Dead Horse state park, about 5 miles from downtown Cottonwood. It takes us about 2 hours and 15 minutes for us to get our fly fishing fix... the trout are stocked but it beats not fishing.